. :Save Our Strays Dog North East Rescue Charity About Us page:. We are a small local rescue charity based in the North East of England, which is run by Margaret Young, Peter White and other members. We take the many unwanted dogs from the local dog pound and care for them until a new home can be found. All the dogs are in foster homes or boarded at private kennels. 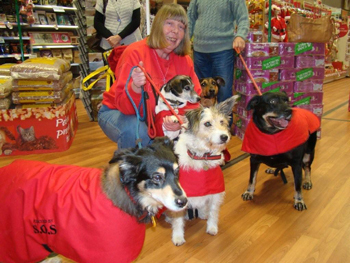 Margaret and Peter have worked tirelessly since setting up Save Our Strays 10 years ago and, together with a group of volunteers, have now rehomed 1400 dogs. We are all volunteers and we are passionate about our work - new faces always welcome. We feel that it is appropriate at this time to remind everybody what our policy is for taking dogs. 1. First and foremost dogs that are unclaimed in the local dog pound.This includes all breeds. 2. Referrals from the police or social services where the owner has died or suffered extreme illness or trauma. 3. Dogs from private homes where there is a crisis situation.